If you use a flash drive, aka USB drive or thumb drive, you've loaded files onto it that need protection. The best way to do that is to encrypt the drive. 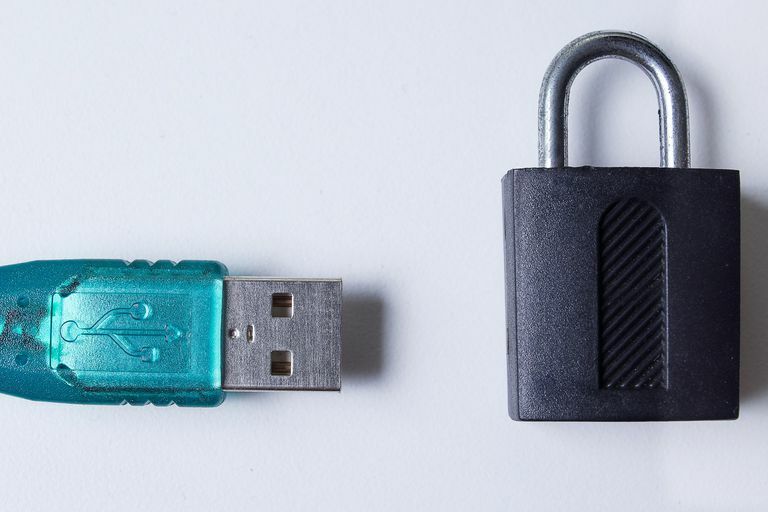 Protecting data on your flash drives is important for a few reasons. Their portability means its easier for anyone to accidentally walk away with them. In addition, the type of information you want to always have handy could include sensitive items, such as medical or financial info. It uses very strong encryption, supporting most of the major algorithms (including AES, Twofish, and RSA) at a strength of 256 bits (more bits is better). It supports encrypting not just files, but also folders, disk partitions, or even entire drives. It operates "on-the-fly," meaning you won't always be waiting for a decryption process to finish before you can use your data. Once you open an encrypted volume (more on this later), it works seamlessly. While the GUI takes some getting used to, it's easy enough to understand. It's cross-platform on desktop systems, meaning you can use it on Windows, macOS, or Linux. In the following sections, we'll use VeraCrypt to encrypt a drive, then "mount" that drive so we can exchange data with it. Installing VeraCrypt is straightforward. First, download the appropriate package for your platform: MSI installer for Windows, DMG for macOS, or Bzip archive for Linux. On Windows, run the MSI. For macOS, VeraCrypt requires that FUSE support for OSX be installed. Once it is, download and double-click the VeraCrypt DMG archive, then run the .PKG installer inside. On Linux, download the archive containing the installer. It contains both command line and GUI versions, for either 32-bit (x86) or 64-bit (x64) systems. Run the one for your processor and desired interface, accept the license, provide your root password, and the installer will copy the appropriate files. Being a highly secure application, VeraCrypt cryptographically signs the download files. Then, the installation instructions recommend verifying your download to confirm what you downloaded is in fact the version the project published. This isn't strictly necessary, plus it's a bit tricky. The step-by-step is beyond the scope of this article, but you can follow these steps to verify the digital signatures as recommended in the install instructions. Once VeraCrypt is installed, you can launch it from your systems main app menu. The first step to encrypting your drive is to create a volume. This is VeraCrypt's term for... well, think of it as an encrypted vault. Basically, you'll create a volume, then mount that volume somewhere on your system where your files will appear. A wizard will lead you through the install. First, you'll choose whether you want to create a "container" (sort of a vault-in-a-file), or to use an entire partition/disk. Select the Create a volume within a partition/drive option, then click Next. Next click the Select Device to show a list of the storage devices you can encrypt. This will include hard disks, including the one containing your OS. Be very careful you select the correct one, as creating the volume will erase everything on the disk. The wizard will show you a warning message to this effect. Once you've selected your thumb drive (again, not one of your hard drives), click Next to continue. You have the option of creating a Standard VeraCrypt Volume or a Hidden one. The Hidden option seems targeted at very sensitive information, so the Standard one will do. You'll now be asked what kind of encryption you want to use. Explaining the nuances of each one of these is beyond the scope of this article (or any single article, probably). The default values (AES for the Encrypton Algorithm and SHA-512 for the Hash Algorithm) are more than enough. The time and effort required to even try to crack the encryption wouldn't be worth it. Now you'll need to pick a password for the device. Take a moment to read the note on what constitutes a good password (hint: mypassword123 is not a good password). Make sure it's something you'll remember as well. If you forget it, you'll have just as much luck trying to retrieve your data as the would-be criminals (not much!) You can ignore the check boxes here, there are other ways to secure the data, but for the purposes of this portable device they'll make things more difficult. Click Next once you're done. The next step is to pick the filesystem of the volume. Consider FAT or NTFS, since both are readable by most operating systems. You can select the Quick Format option as well, for precisely the reason explained by the on-screen note. Once you start using the volume, files and folders you place there will be encrypted "on-the-fly" as you create them. Now the installer will start creating the encryption key. It needs some random data to do this, and the way it does so is by capturing your mouse movements. Start moving your cursor around the window; you'll notice the progress bar starting to fill up. Once it's complete, you can click Format to start encrypting your drive. At last, your encrypted device is ready. Click Exit to close the wizard. Now that everything is secure, you need to use VeraCrypt to mount the drive onto your system in order to use your it. This means VeraCrypt is taking the encrypted physical device, and hooking it up to a location on your PC to look like a "regular" drive. You read data from and write data to this "regular" drive, and behind the scenes VeraCrypt de-/encrypts it on the fly. Launch VeraCrypt, and you'll see the main window as shown in the screenshot here (taken on Windows 10). First, notice there are a list of drive letters in the grid at the top. Drive letters already assigned to other devices (such as your main C: drive, or a secondary hard drive on a letter like D: or E:) don't show up here, only free ones. Select one of these (we selected R:) — this is where the encrypted drive will be mounted. On macOS and Linux, the drive letters are replaced by numbers, and the mount point will be a standard file path. Select one of these as the target for your encrypted data. Next, click the Select Device, just like you did above to create the encrypted volume. I selected the K: drive my thumb drive was assigned. Finally, click Mount. You'll be asked for the device's password, after which see the drive letter updated with the volume's name next to the drive you selected. At this point you can close the VeraCrypt window, although it will keep running in the system tray. You can now copy, paste, open, save, and otherwise do all manner of file-related things securely. But remember to use the mounted drive now (R: in our example). Your OS will likely tell you it can't read the physical drive. This is what you want — everything's encrypted. When you're done using your thumb drive, just select it in VeraCrypt and click Unmount. That's all there is to it: USB thumb drive security made simple.